“A brilliantly awful persona of an old-school, C-list funnyman—the kind with an ill-fitting tuxedo and an enormous, greasy combover—on a very bad night. 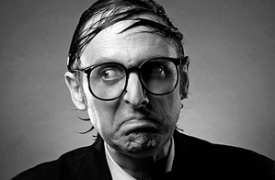 Neil Hamburger toys with an audience’s expectations (and patience), and indeed his act is a kind of rude commentary on stand-up comedy altogether.”—(New York Times) America’s Funnyman Neil Hamburger is the hardest working comedian in existence, performing up to 399 shows a year to critical acclaim and audience bewilderment. He has toured as the hand-picked opener for Tenacious D and Faith No More, appeared on TV shows ranging from Tim and Eric Awesome Show to Jimmy Kimmel Live, and worked extensively with Tom Green on his internet talk show. Among his dozen or so albums and DVDs is the new LP release Hot February Night.